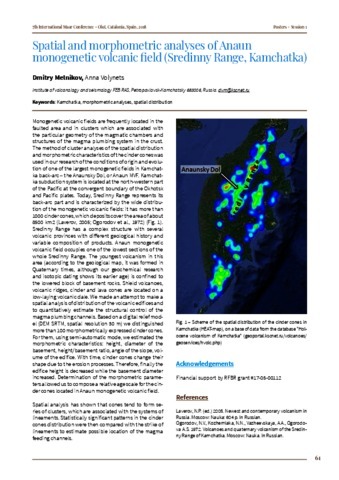 We studied the tectonic setting, morphology, geologic structure, history of eruptive activity and evolution of the composition of the erupted material of Kizimen volcano, Kamchatka, from the moment of its origination 11–12 thousand years ago to the present time. 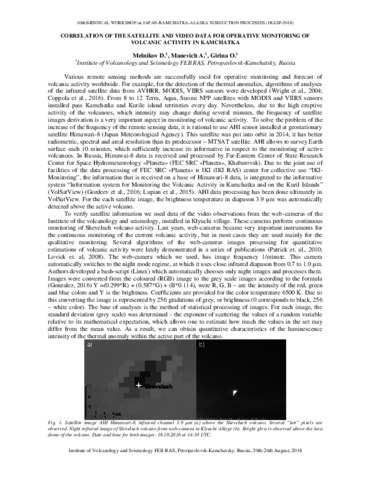 Four cycles, each 2–3.5 thousand years long, were distinguished that characterize the activity of the volcano. All of the largest eruptions were dated, and their parameters determined. We also estimated the volume and the mass of the erupted products, the volcanic intensity of eruption of material during periods of high activity, and the amount of material the volcano ejected at different stages of its formation. It has been shown that the evolution of the composition of the rocks erupted (from dacite to basaltic andesite) takes place as a result of mixing of dacitic and basaltic magma. 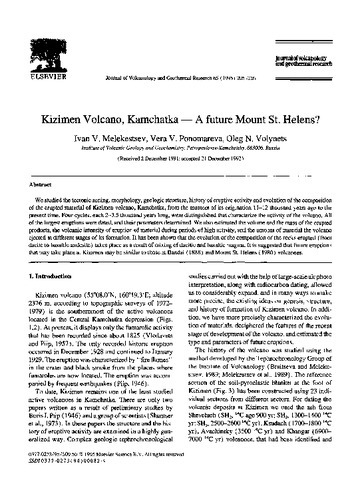 It is suggested that future eruptions that may take place at Kizimen may be similar to those at Bandai (1888) and Mount St. Helens (1980) volcanoes. Melnikov D.V., Manevich A.G., Girina O.A. 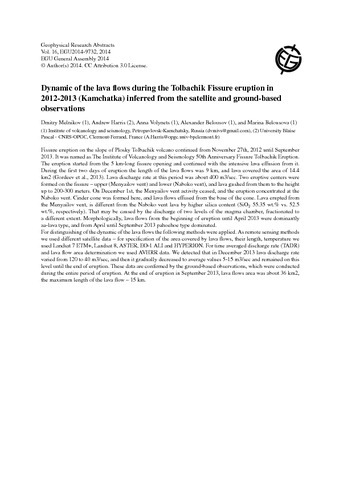 Correlation of the satellite and video data for operative monitoring of volcanic activity in Kamchatka // JKASP-2018. Petropavlovsk-Kamchatsky: IVS FEB RAS. 2018. 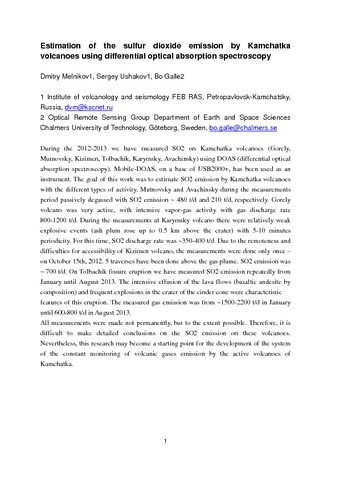 Concentrations and emission rates of major gas species were measured in August 2015 at Ebeko volcano, a quiescently degassing andesitic volcano on Paramushir Island, Northern Kuriles. Using mobile and scanning DOAS measurements we estimated SO 2 emission from the active crater of the volcano at 100 +36/-15 t/d. Based on the comparison of plume areas of individual fumaroles, ca. 90% of the total gas emission from Ebeko in 2015 was provided by a single powerful vent (" Active Funnel " fumarole) and the rest was shared among low-temperature fumaroles. At the time of measurements, gases from the main fumarole had temperature from 420 to 490 °C and composition close to the average arc gas , as shown in Table. Gas species CO2 SO2 H2S HCl H2O T, °C mmol/mol Main fumarole 27.9 23.5 6.1 5.6 936 420 Low-temp. jets 92.2 2.62 0.68 1.6 902 <120 Low-temperature fumaroles (<120 °C) emitted gas enriched in CO 2 (up to 28 mol%, 9.2 mol% on average). Such CO 2 enrichment together with depletion in HCl and sulfur species can be explained by scrubbing of soluble gas species by a well-developed hydrothermal system which discharges ultra-acid SO 4-Cl waters . A weighted-average estimate of the total gas+vapor emission from the Ebeko summit provided 1470 t/d, which includes ~ 101 t/d SO2, ~ 110 t/d CO2, ~ 14 t/d H2S and HCl, and 1230 t/d of water vapour with > 50% of the magmatic component. 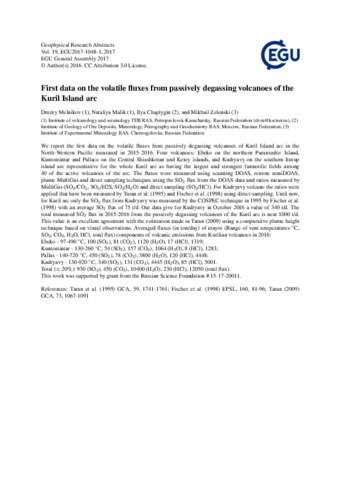 The gas fluxes measured in August 2015 using DOAS fall into the range of previous measurements made from 1960 to 2012 that used direct methods  and correspond to the moderate degassing rate of the volcano.